Trump Completes His Employee Performance Review Where is Grover Norquist’s Opposition to Tariffs? Why The GOP Silence on Trump and Russia? Because They Are All IN! A Siberian woman charged as part of an alleged Russian plot to interfere with U.S. politics was at Gov. Scott Walker’s presidential campaign launch and said she did not see him as being hostile toward Russia. The woman, Maria Butina, attempted to make inroads with American politicians to influence U.S. policies toward Russia, according to court documents filed Monday. 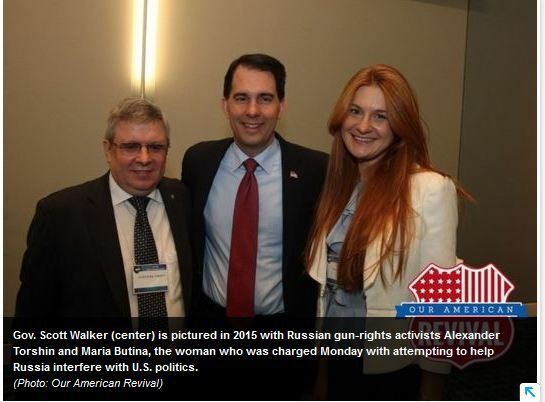 Walker is not named in Butina’s criminal complaint. Butina attempted to advance the interests of Russia “by developing relationships with U.S. persons and infiltrating organizations having influence in American politics,” according to a news release from the U.S. Department of Justice. Before news of Butina’s indictment became public, Walker on Monday declined to weigh in on whether he agreed with President Donald Trump that he did not see why Russia would have interfered with U.S. elections. And then you might recognize the two people on the right…Ms. Butina and former Milwaukee County Sheriff David Clarke! In 2015, Clarke took a trip to Israel and Russia valued at nearly $40,000 that was funded in part by Right to Bear Arms, a gun rights group founded by Butina. 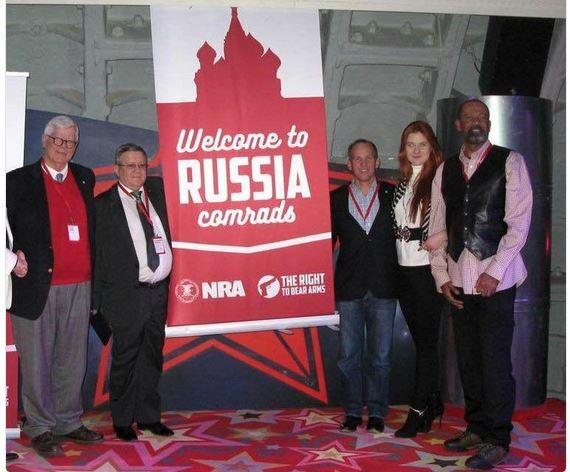 Butina said in 2016 her group hosted Clarke and others with a National Rifle Association delegation because her group wanted to learn from the NRA. 2 Responses to Why The GOP Silence on Trump and Russia? Because They Are All IN! I got a years supply of caviar. Wow! It would be beyond rich if our own little weasel could be the one to knock the keystone outta the Trump Regime. But, to paraphrase my friend Observer, Guvvie is just too dam slippery.